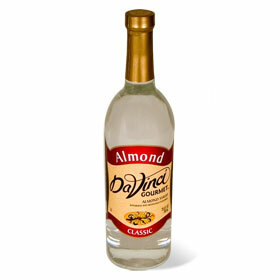 Almond Syrup is one of the most popular varieties of DaVinci Gourmet flavoring syrups. Almond syrup can be used in entree recipes, vegetable recipes and dessert recipes. It's famous for enhancing the natural flavor of brewed coffee and polishing espresso coffee drinks. Almond syrup is a delicate blend of the natural flavor and is made from all natural almonds. Almond syrup is also available in sugar free for diabetic recipes and sugar free diets. Preheat oven to 325°F. Crust: Either process wafers in a food processor or crush with a rolling pin. Brush 1 1/2 tablespoons melted butter in bottom of 9 or 10" spring form pan. Sprinkle wafer crumbs in bottom of pan, tilting and tapping pan to completely cover. In a double boiler or in a saucepan on very low heat, melt white chocolate chips or white almond bark. Stir every few minutes with a rubber spatula. When melted, remove from heat and set aside. In a food processor fitted with a steel blade, blend cream cheese and sugar until very smooth. Add eggs one at a time and process to incorporate. Add melted chocolate and Almond Mocha syrup, blending until thoroughly mixed. Pour white chocolate cream cheese mixture into pan and bake for 18 minutes. Remove carefully from oven and allow to cool for 15 minutes.